By "crushed gravel" driveways we mean those composed of coarse sand intermixed with small stones. But this terminology is regional, and many find it confusing. 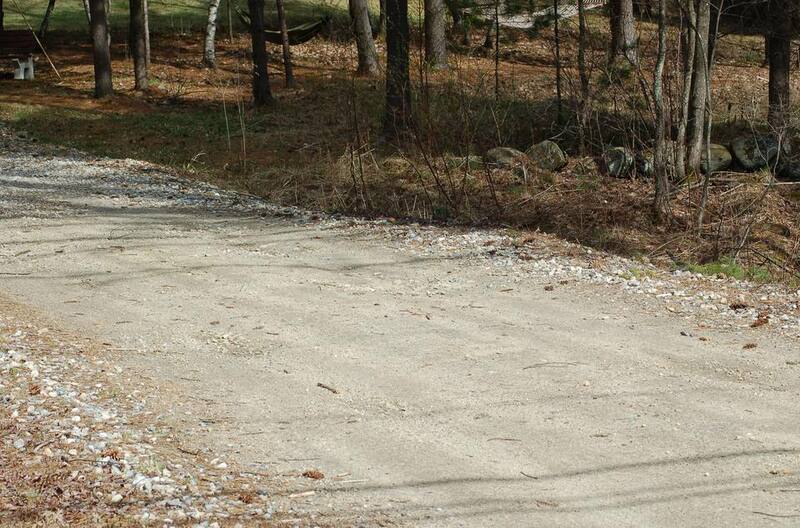 What we mean by "crushed gravel" driveways (photo at left) is distinct from what we would term, "stone" driveways. Crushed gravel driveways are commonly composed of sand, silt, clay and larger aggregates (pebbles and small stones). Stone driveways, by contrast, are often more elegant. The source of the confusion over terminology is that the small stone used in stone driveways is sometimes also referred to as "gravel." This addresses the fact that much confusion exists over the terminology used when discussing these driveways, despite their ubiquity. When we refer to "stone" driveways, we mean driveways whose surface is composed entirely of small stones. Obviously, water will drain through this material as it would through a sieve. By contrast, crushed gravel driveways, the subject of this article, have surfaces designed to shed water. This is accomplished through the sand, silt and clay particles between the larger aggregate, acting as a binder. Some people may know this type of driveway as a "dirt" driveway. However, "dirt" is such an imprecise word that we avoid it here, despite the potential for confusion over the use of the term, "gravel." Some (but by no means all) of the pros and cons discussed on this page also apply to other driveways similar to crushed gravel driveways; for instance, driveways composed of small stones, crushed seashells or cinder (although none of these are as dirty as crushed gravel driveways, and all are more attractive). Note also that not all crushed gravel driveways will perform the same way, due to the fact that their compositions will vary (how the material is screened, etc.). Because crushed gravel driveways are inexpensive, they are often the driveway of choice in rural areas where "keeping up with the Joneses" is not an issue. Homeowners often have more crushed gravel added periodically as ruts form and crushed gravel is lost, but that's easy enough: you just have another load of crushed gravel dumped and spread (although it's just a temporary fix). With crushed gravel driveways, a base with good drainage is important, so make sure the individual installing your crushed gravel driveway pays attention to it, or you could be in for problems. Nonetheless, crushed gravel driveways do generally require less repair or maintenance jobs for you. There will be no sealing, no patching and no cleaning because there isn't any hard surface that can be damaged or stained. But crushed gravel driveways aren't the most attractive of driveways, although they may work fine aesthetically if you're striving for a "folksy" look in your landscape design. Crushed gravel driveways are a mixed bag in Northern climes. On the one hand, they "roll with the punches" comparatively well during the freezing/thawing cycle; "frost heaves" are a much bigger deal if you own, say, an asphalt driveway. But crushed gravel driveways can make snow-removal a bit more difficult: they lack a flat, clean surface over which to run a snowblower or scrape a shovel because small stones stick up and will be in the way. Road surfacing gravel needs to be able to hold itself together to fight the effects of water and traffic. It requires binder, in the form of particles of silt and clay to fill the voids between the larger aggregates and act as a sort of cement. Surface gravel should not allow water to pass through it into the base. Instead, it should shed water to the ditches because of its shape.